Happy fourth birthday to my blog! I can't believe i've been doing this blogging thing most days for the past four years, but I love it and don't want to stop just yet. Thank you very much for visiting me and for all the emails and comments and real mail you send my way. This blog has really enriched my life. I mean it. So, to say thank you, I thought I'd offer a small giveaway. 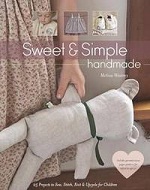 I recently bought a copy of this book, The Handmade Marketplace by Kari Chapin and it's great! It's so nicely put together (including illustrations by Emily Martin) and is chocoblock with ideas and advice about selling your crafts and artwork. Now i've finished reading it, I thought I should pass it along to someone else who might enjoy it. I'll package it up with a set of my newly-printed watercolour postcards and another small handmade something. All you need to do is leave a comment on this post, telling me something about yourself- anything you like but it would be interesting to hear what music you are enjoying these days. Thank you again for reading my blog and supporting my work over the past four years. p.s. I'll send the parcel anywhere in the world, and i'll leave this open until Monday morning. Have a good weekend!